TORONTO [13 August 2015] An international team that includes astronomers from the Dunlap Institute for Astronomy & Astrophysics has discovered a first-of-its-kind “young Jupiter” exoplanet which could help explain how our Solar System formed. 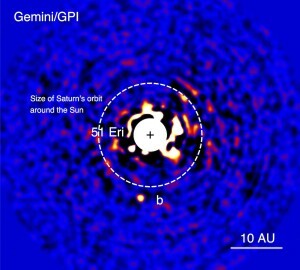 Called 51 Eri b, it is the first planet detected with a new exoplanet-hunting instrument called the Gemini Planet Imager (GPI). 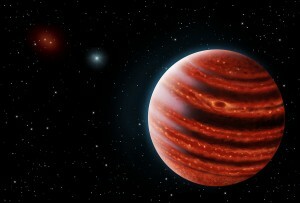 Unlike the Kepler space telescope which detects exoplanets indirectly, the ground-based GPI lets astronomers see and study these distant worlds directly by first correcting for the blurring of the star’s image caused by the atmosphere, then by blocking out the star’s light to reveal the much fainter planet. In addition, GPI is a spectrograph, capable of analyzing light by wavelength. The instrument was designed specifically for discovering and analyzing faint, young planets orbiting bright stars. “This is exactly the kind of planet we envisioned discovering when we designed GPI”, says James Graham, professor at UC Berkeley and Project Scientist for GPI. Graham helped develop GPI while director of the Dunlap Institute. He and Stanford Physics Professor (and U of T alumnus) Bruce Macintosh lead the GPI collaboration and are lead authors of the SCIENCE paper being published today announcing the discovery. Co-authors of the paper include Dunlap Fellows Jeffrey Chilcote and Jérôme Maire, as well as U of T PhD-candidate Max Millar-Blanchaer. 51 Eri b orbits a relatively young, 20 million year old star named 51 Eridani; the star is 100 light-years from Earth. Of all the exoplanets discovered through direct-imaging, 51 Eri b is the faintest and, at twice the mass of Jupiter, also the lowest-mass. It orbits slightly farther from its parent star than Saturn does from the Sun. What’s more, 51 Eri b is the coolest of the exoplanets discovered through direct imaging. Its atmosphere is about 430°C—much cooler than most other exoplanets. Combined with the age of the system, this is a clue that the distant planetary system may have formed through a process called core-accretion that can also lead to smaller, rocky planets like Earth. With its spectrograph, GPI also revealed a strong methane signal from 51 Eri b. Other exoplanets have only faint traces of methane, which makes this newly-discovered world much more like the methane-rich gas giants in our Solar System. Simulated fly-by of the 51 Eridani star and planet system from Franck Marchis on Vimeo. The Gemini Planet Imager is installed on the Gemini South Telescope in northern Chile and began operating in late 2013. 51 Eri b is the first exoplanet to be discovered as part of the GPI Exoplanet Survey which will target 600 stars over the next 3 years. The Dunlap Institute for Astronomy & Astrophysics continues the legacy of the David Dunlap Observatory of developing innovative astronomical instrumentation, including instrumentation for the largest telescopes in the world. The research of its faculty and Dunlap Fellows spans the depths of the Universe, from the discovery and characterization of exoplanets, to the formation of stars, the evolution and nature of galaxies, dark energy, the Cosmic Microwave Background, and SETI. The institute also continues a strong commitment to developing the next generation of astronomers and fostering public engagement in science.